Assistant Referee Amanda Ross has revealed her excitement ahead of the NWSL Championship Game on Thursday, October 1 between FC Kansas City and Seattle Reign. Ross has been assigned as AR1 to the game in Portland, alongside referee Katja Koroleva, AR2 Jennifer Garner, fourth official Margaret Domka and reserve AR Benjamin Wooten. 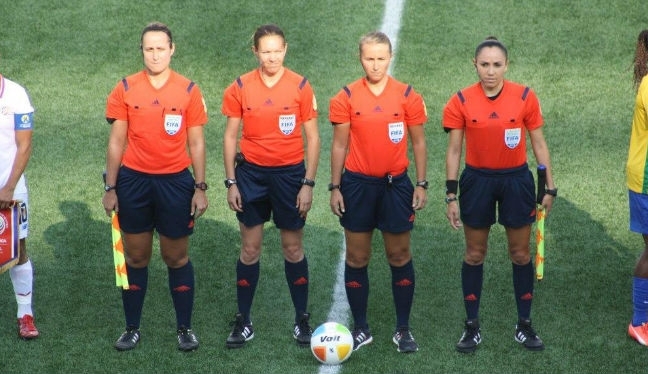 “I was very excited when I saw the assignment, especially when I saw who the crew was,” the AR, who recently officiated at the Pan American Games alongside numerous PRO colleagues, told proreferees.com. “I’ve worked with Katja, Margaret, and Jen several times this year, although this will be my first time working with Ben. Ross, who has ran the line in the NWSL semifinals in the last two years, has officiated games in the league and the USL in 2015 which has contributed to her having a positive season. Her assignments included officiating Kansas City versus the Reign earlier in the year, but she’s fully aware that the Championship decider is a one-off match, which will give it an added edge. “It is an honor to be assigned to the Championship game. To have the opportunity to work the final this year is very exciting. “The stakes of this match will be much higher. Seattle won the regular season title last year, but FC Kansas City won the championship match. Seattle won the regular season again this year, so they are looking to avenge last year’s loss. “Plus the game will be played at a neutral site for the first time, in Portland, which should draw a good crowd to make the atmosphere more intense and exciting. “To prepare for this game, I’ll be watching previous matches, like I do for most games, specifically the semifinals both teams played in, as well as their games against each other. “One thing about this game that is different from most other assignments is the amount of time between the semifinals and the final. “The teams have a lot of time to prepare, and as referees we will use that time as well to make sure we’re sharp and prepared.